The Federal Government recently initiated a move to re-arrest the leader of the Indigenous People of Biafra (IPOB), Nnamdi Kanu after he was granted bail by an Abuja Federal High Court. Meanwhile, Kanu in an exclusive interview with OKEY SAMPSON vowed to resist the arrest, insisting that Nigeria would burn if the Federal Government move to re-arrest him. He also spoke on other issues as they relate to the agitation. You’ve toured the territory called Biafra since you came out of detention, what is your impression about what you have seen so far? I’ve not completed the tour as a matter of fact. What I have seen so far is much enthusiasm. I have seen hope, the rekindling of hope and I have seen the burning desire for genuine change and the call for freedom which is exactly what we are doing and pursuing. There is no visiting dignitary, Head of State, political or religious leader that has been able to command the type of crowd that come out anywhere I visit or any town I go to. It has never been replicated or set as a precedence ever before. All the crowd that came out to welcome me were unprecedented; they came out in their historical numbers to witness the gospel that I preached. I don’t pay any of them. In fact, those people are the ones who are responsible for the running of IPOB and to make things happen. If I were to visit Lagos, it will be the same, If were to go to Kano, it will be the same thing. People will come out to see me because I preach the truth. What has been the message all this while? The message is that we IPOB members must remain resolute, disciplined and focused in all we are doing. We are not going to relent; the call for Biafra is our own interpretation of the principles of self-determination.That’s exactly what we are doing. There are reports that you’ve reneged on your call for the boycott of the Anambra election. Could this be true? I gave a speech in Aba, Abia State on Sunday and I made it absolutely clear that the boycott stays. We must boycott election in Anambra State.It is our civic responsibility to do so and that’s what we are going to do – total and absolute boycott, to let the whole world understand the strength of IPOB on the ground, in Anambra State. Recently Arewa youths order ed the Igbo in the North to leave and nothing happened to them. The same Arewa youths are calling for your re-arrest and the Federal Government is making moves towards that. How do you reconcile this? President Buhari in a recent broadcast said Nigeria’s unity is non negotiable and directed the security agencies to deal with any group that will work against this. What’s your reaction? I don’t place any degree of importance to his speech and I will tell you why. First, I don’t believe he was the one that wrote the speech, I don’t believe he was the one that read it. If they prove me wrong, they should subscribe to a DNA test. That is number one; number two, if that speech was contemporary as they made us believe and not a generic one, how come there was no mention of the quit notice, how come he did not call for the people inciting Northern youths, Almajiri to genocide? Why is it that those calling for the re-arrest of Nnamdi Kanu cannot call for the arrest of the so called Arewa elders, not the youths because they came out to say that their elders knew what they were doing. They have the support of their elders, even the governors, that’s what they said. Why is nobody arresting them because they are in the army, they are in the air force, they are in the police, there is Fulani everywhere, they control everything so, when they speak, you are supposed to be shaking, but unfortunately, I’m not one of those that shake; instead when I speak they should be shaking because they know what is behind me. They are more intelligent than most people, I give them credit for that, they know what it means to arrest me, they understand the implications. Look at the first one they went through, Nigeria is at the brink of collapse. Second one, we kick it over the precipice I assure you. Life to me is meaningless, the only thing that gives me hope everyday is the idea that I may see Biafra. If I am not a dead man, what am I doing without Biafra? Life will be meaningless, useless to me. You spoke about the wall of the country falling if you are re-arrested. Since IPOB is non violent, how are you going to achieve this? Apartheid collapsed in South Africa, segregation collapsed in the USA, Martin Luther King had no weapons, the same thing is happening. There is a superior force fighting for us in heaven, Chukuokike Abiama, the Almighty God in heaven is fighting. This is His battle, it is not Nnamdi Kanu or IPOB’s battle. God is fighting His battle for us. Have you ever heard of earthquake in Nigeria? It happened in 2016 in the North when I was arrested; have you heard of locusts swarming everywhere and damaging crops before? These are plagues of biblical proportion and it is just a warning, a tester of what is to come. What I represent is greater than who I am and the God that we worship, Chukuokike Abiama is about to make manifest that the whole world may know that Biafra is very special, exceptionally special and there is nothing any man can do, absolutely nothing. You said God gave you a message for the Igbo, can you share the message with us? That Biafra is coming and that we must remain very strong and resolute. The only thing He requires of us is to worship Him, that’s all He wants us to do and not to worship idol and Biafra will come and the world will see and will testify it. The Igbo should turn away from idolatry and face God and Him alone, that’s the message he said I should give my people. What is delaying Biafra is that the people have not turned away totally from worshipping idols. I will be going to Arochuwku to build a temple there and we’ll worship God how it used to be. There was a time God loved us, we used to obey Him by going to Arochukwu to offer Him sacrifice. We started suffering as soon as Arochukwu failed, because the people dabbled into idolatry. You said you would visit Lagos and Kaduna in no distant time. Don’t you feel for your security? I have a lot of friends in Lagos and Southern Kaduna too. When the time comes, I will visit those places. You spoke about my security, but I’m telling you that I’m not living any more.What you are seeing is but an empty shell that is only seeking for Biafra. You keep saying that all you think about is Biafra, but MASSOB founder, Chief Ralph Uwazuruike once said that you do n’t know anything about Biafra. What’s your reaction? Isn’t it very sad that the only way he could attract attention to his publication was by mentioning the name Nnamdi Kanu? That’s how low he has sunk. Had he not mentioned Nnamdi Kanu, nobody would have bought any newspaper having such an interview; it’s a shame, isn’t it? How the mighty has fallen. If Uwazuruike had not mentioned Nnamdi Kanu, nobody would have read anything he was writing. That’s my answer. Uwazuruike went further in the interview to say that I’m calling for the boycott of Anambra election to help APC win the election. But I want to tell him at various times I have been accused of supporting virtually every political party in the country and every major player. But the thing of joy for IPOB is that we have the benefit of longevity and time; there is no lie that time will not reveal. Now, it is clearly demonstrated beyond every reasonable doubt that when former President Goodluck was in office, I went hard after him. It was said that I was being sponsored by APC. APC came in, I went after Buhari, but Jonathan was very sensible not minding where we have disagreement, he was very sensible, he ignored me. He knew that as a democrat, as a Biafran at heart that how you kind of moderate views and emotions within a society is to ventilate them and allow people to say what they want; that the reason we have the National Assembly is not to make laws only. You create room for people with diverse views and opinions and ideas. It’s better they are ttalking than fighting, that’s why you have parliament, people don’t know that. I heard that he equally said that if I need money that I should come to him, but what Uwazuruike has refused to know is that I am not a money monger like him; we are not the same. All he thinks about is money, but I think about Biafra and that’s the huge difference. He has been abandoned by his slave masters, the Hausa/Fulani he has been serving so diligently for many years. The wool has fallen off the eyes of our people; everyone knows he is a fraud. What am I doing with money? If I were looking for money, I would have settled with the Buhari government. I don’t need money, the only thing I need is Biafra, Uwazuruike cannot do what I did, he can never do nothing in a billion years. Now, I’m very glad that he has seen that all the money he made,is worthless because he has lost his reputation, he has no name to fall back to. People give me stuff, the cars I use, people gave them to me. I don’t buy anything, so, what do I need money for? I don’t need to buy anything, the furniture in my house, people built them for me. I am serving my people everyday and today we have honour and prestige because of IPOB. It’s not only our people, every other component ethnic nationality, is rising up to speak because of IPOB. If I had compromised, do you think they would have the courage to rise up? It’s called honour and integrity and Uwazuruike has got none. President of Arewa Youths Consultative Forum, Alhaji Shetima Yerima has urged the relevant authorities to deal with anybody who violates the suspension of the quit notice to the Igbo residing in the northern parts of the country. In this interview with WILLY EYA, he said the quit order belongs to the past as the objective has been achieved by Arewa youths. He spoke on other issues. The Indigenous People of Biafra(IPOB) led by Nnamdi Kanu has rejected the suspension of the quit notice to the Igbo residing in the North; what is your reaction to that? How is that my problem? Did I do it for him or in the interest of the country? His rejection of the suspension of the quit notice is not important to me. What we did was to demonstrate that we have a culture. We give respect to our elders and it was to ensure that the country remains together. The country is above anybody. On that basis, his acceptance or not is not important but I know that he also is not speaking for the Igbo. It is a minority view of few people making all sorts of noise. It is not really important to me and I do not want to join issues with them. Nigeria is above everybody and I stand on the path of one united country. We have to build a nation that we can call our own. Even after the suspension of the quit notice, there are still fears that you cannot rule out pockets of harassment of the Igbo at the expiration of the October 1 deadline to them. Are the Arewa youths doing anything to ensure compliance to the suspension? Nobody would do anything. Anybody who does anything, we make sure that the authorities arrest the person. We are in charge. Nobody should be scared of anything. Our youths are reasonable; they are known to respect one another; we listen to our leaders unlike some other parts of the country. But having said that, you can be rest assured that there is no cause for alarm. So, let Nigerians be rest assured that nothing would befall anybody by God’s grace and we are working towards that and we would give the government the maximum support. Our brothers across board, we would make sure that no evil would befall them. That is the position of things. It is unfortunate and I would not hesitate to condemn hate speeches among the people because it would not do the nation any good. We must ensure there is a law to guide the people against it and not only a law that would merely be pronounced but that would catch up with anybody that contravenes that law. So, the National Assembly must move fast to ensure that such a law is really enshrined in our constitution. It is so that at the end of the day, nobody would have used the sensibilities of anybody in a nation that we claim belongs to all of us. In as much as everybody has the right for self-determination under the international law that Nigeria is part of, we are also saying that whatever you do would be within the limits of the law. This is so, so that you do not abuse or drag anybody, advocate a war, malign any section of the country and you can go about doing your things lawfully without witch-hunting anybody and calling for war. That is the genesis of the quit order. There is an increasing momentum on the call for restructuring, are you for or against it? I am an advocate of restructuring any day and time but we have to be mindful that time and events change things. The heart of the matter is that in as much as I believe in restructuring, we also need to be cautious and mindful of the time we are speaking to that restructuring. As we speak today, the definition of restructuring is neither here nor there. There are a lot of problems in Nigeria today. My suggestion is that we should wait for 2019 after a new government would have been installed to carry out the restructuring that we want to do. I believe that when a new government is in place, we can begin to advocate for restructuring. The next government, whoever wants power, can begin to campaign for restructuring and accept that there is an agreement between him and Nigerians before they can vote him into office. That means that the moment the government comes into place, we can begin to talk about restructuring. The whole idea about restructuring is about give and take. But many believe that Buhari has the capacity to ensure Nigeria is restructured if he is favourably disposed to it and that delaying it is like postponing the evil day. What do you think? Do not forget that Nigeria has never had this kind of period where her unity is threatened and such issues are so fundamental that if we do not take measures to manage them, we would be in very big trouble. So, we need to save the country before we begin to talk about restructuring and what to share or not. What is your position to the allegation that the North is resisting restructuring because her people had been the greatest beneficiaries of the present contentious structure of Nigeria? What is the North benefitting? The poverty, backwardness or the system that has marginalized the generality of our people? Certainly, we are not benefitting from what is going on in the country. We are also saying that if the country is not safe, there would not be anything to share. We are saying that there is always long and short term approaches to issues. We are saying nobody is afraid of restructuring but that it is secondary; let us face the reality on ground which is what we are doing now. We must first of all save the country. We are faced with a lot of challenges and particularly the unity of this country is being threatened. We must be sure that we do away with the bad side of it. Once there is a strong system in place and we all agree that we all belong to this country, then we can be rest assured that people can now face restructuring. For instance, we are working towards having a national peace summit in the middle of September. At that level, we would all reaffirm our allegiance to the country and we can begin to build the nation. Then after this government, the next one can come up with the issue of restructuring and we can look at it. I am an advocate of restructuring and I am not denying it. People who know you were surprised that you championed the quit notice considering that virtually all your life, you have lived outside your region and specifically in the Southern part of the country. I do not want to dabble again into the quit notice because it is a forgotten issue. It has been overtaken by events. Let us not go back to it. Some madness came from some angle by somebody who believes that he can undermine our elders and leaders and at a point, somebody had to make a statement to bring him to order. That has been achieved and so far, so good. I am happy we are no more hearing those languages of we are going for war, we would make what happened in Sudan a child’s play and all that. I think those languages are over. Honestly, I do not want to be involved in the quit notice any more because I have gone beyond that and it has got behind me. We are just looking for a way to build the nation. But in building the nation, what is the way forward considering the level of ethnic division in Nigeria today? The way forward is that we must insist on equity, justice and fairness to all. If you do that and we now have a country where nobody is marginalized and where everything is well put in place, you can be rest assured that the agitation would naturally die. I believe in this generation and I insist that things must be done right and we must begin to build the Nigeria of our dreams. On the road to 2019, what is your advice to politicians? The politicians must know that it is when you have a country that you can begin to play politics. This is because once Nigeria is into chaos, nobody would be talking about going to occupy any office. So, what is before all of us now is to join hands and build the nation. And we would resist any politician from any part of the country that tries to instigate anybody. The issue is about equity and fairness to all. That is the only way we can build a nation of our own. I believe strongly that at the end of the day, we would arrive there and have a nation of our own that all of us would be proud. What are your greatest fears about Nigeria? My greatest fear is to wake up one morning and find out that there is no country called Nigeria. That was why we took steps toward the right direction; we are ready to make sacrifice so that Nigeria remains together. I am sure that our founding fathers who fought tooth and nail to sustain the unity of the country, wherever they are even in their graves, they would not be comfortable. They would be saying that this is not what they bargained for the country. So, we are going to ensure that the unity of the country they fought for is being sustained. What are your regrets about events in Nigeria today? Honestly, I have a lot of regrets and reservations. This is not the country we dreamt of. I remember at the time I came into limelight in the struggle, that was about 18 years ago when I was a young student; this is not the kind of Nigeria we all envisaged. Why we put our lives on the line during the dark days of the military and even at the expense of our families, enjoyment and all that, is to have a better Nigeria. I am not happy that after all these years, I am still in the trenches. I wish we have come to a stage where I can relax comfortably with my family. I wish we have a country where we can look back and say yes, this is the result of the sacrifice we have made. But now, I look at the situation, I look at myself and I begin to sympathise with myself. Sometimes I share tears and I cry in my heart. After we fought and took the military back to the barracks, I thought that we would have been enjoying this democracy. But today, I keep talking and I do not know when it would end. I am tired and my family is also tired. But do you think that there would be a time in Nigeria when people of different ethnic regions would sit down around a table and see one another as one like it used to be in the good old days? I have no doubt in my mind that we would get there someday but it requires collective sacrifice by all. How did you become an activist? Was it by choice or happenstance? I went into activism because of my passion for humanity. If I went into activism for money, I could have got what I wanted. If you look at my contemporaries, I am the poorest because I have been fighting for the public. Go and look at the records among all the people I started the struggle with. I would not mention names. As popular as I am, if I wanted money, I would have made money long ago but against all odds, I stood by my principle. I feel that injustice to one is injustice to all. I fight injustice anywhere I am. Why I asked this question is that at the heat of the recent tension over the quit notice by the Arewa youths to the Igbo, there were insinuations that you were paid to do a hatchet job. How true is that? People should know that I have an identity. There is no successful activist who did not emmerge from Lagos. This state has shaped my life to fight against injustice. But the fact of the matter is that I have an identity. If you go to my records, you would see that when an issue comes up, no matter who is involved irrespective of where he comes from, I fight for fairness. I have never woken up one day and abuse anybody from the South West, South East or South South. If anybody does anything against my people, I fight against it whether the person is from the North or South. People talk about me now because of the current issues but they should go to my records about two decades ago. I feel bad when that young man, Kanu abuses my entire people. Where was he when we joined the struggle? If he does not know what struggle means, we should tell him what it means. So, people should know me that I would never compromise. If I wanted to get money in the struggle, I would have made millions. I am from Zaria and no matter how long I stay in the South, it does not change the fact that I have an identity and I lead my people. Do you have phobia for the Igbo or you are just fighting this cause based on your conviction? A lot of my friends are Igbo people. I have nothing against the Igbo. It did not end there, let me also demonstrate that to you; my first wife is from Calabar, the old South Eastern region. We have two kids. I have a good relationship with the Igbo. I have attended an event organized in memory of Odumegwu Ojukwu in Owerri under the Movement for the Actualisation of the Sovereign State of Biafra (MASSOB) led by Ralph Uwazuruike. For the past five years, I have been going to Owerri. How best would I describe my relationship with the Igbo? During my school days in Lagos State University, Igbo people are my best friends. I am not against the Igbo but I am against any tribe that abuses the sensibilities of my leaders. And this is what prompted the action but thank God, it has come to an end. I still maintain my relationship with my Igbo brothers. All the ethnic groups in this country, I want to appeal to them, let us come together and build a nation of our own. We should know that all of us are being marginalized and what we should do is to come together and build the nation we can call our own. We are all human beings and we are bound to make things right or wrong. Nothing go happen, i beg. It is no longer empty noise of arrest, re-arrest etc. It is now BIAFRAN REVOLUTION WAR. It is now Operation Burn Down All Enemy’s Barracks in Biafraland of the five south east states. It is the climax of the 50 years Biafra – Nigeria War, which God has given Biafra victory, and Deadline with the political name nigeria, is October 1st 2017. It is either he kanu with ipob group are in or out- members of ipob group is not up to one per cent of Biafran population. Any Igbo man or woman of the five south east states who do not play his or her role in this final battle, will never have a place in God given Republic Of Biafra of the five south east states, will never have rights of Biafran citizenship etc. God can raise the grass to fight for Biafra in this final battle- THE BIAFRAN REVOLUTION WAR. God Is With Us!!! Nobody is greater than democratic transparency and honesty!p in NIGERIA! Social injustices of all sorts are the real enemies of our true Democracy in NIGERIA! Political selfishness promotes all the experienced undemocratic, barbaric and unpatriotic strategies for marginalization, nepotism, militarization, brutality, oppressions of all sorts by NIGERIANS unpatriotic politicans! NIGERIA was amalgamated in the 1914 by the colonial masters! Among other reasons, the colonial masters began to exploit the amalgamated NIGERIANS to mainly promote their own political self-centered and selfish interests! NIGERIAN nationalists began to agitate for independence from the colonial slavery of indirect-rule! The NIGERIAN nationalists began to also negotiate on how to democractically achieve all-inclusive independence for all NIGERIANS of all tribes and cultures! After the 1960′ independence, some NIGERIAN politicians began to exploit other NIGERIANS, especially on tribal and religious differences, to achieve their own political self-centeredness and selfishness! Military came and worsen the whole situation, especially from 1966 to 1999! From 1999 return to Democracy in NIGERIA was reshaped on political dishonesty, insincerity, suspicions and distrust by the same Nigerian politicans, to further exploit other NIGERIANS through tribal and religious differences and sentiments! Agitations began from the North between year 2000 to 2002, with political claims for the establishment of Sharia States, which was subtly established and fermented by the Northern political cabals, including the 2009 Boko-Haran deadly activities in NIGERIA! Formal President Olusegun Obasanjo knew what was politically going on, and said that the agitation for the Sharia States would die natural death! In 2009, they, the Northen political cabals also secretly formed the deadly activities of the Boko-Haran in the Northern NIGERIA, just for their own selfishness and self-centered politicans’ exploitative activities against other NIGERIANS, in promoting their political interests of self-centeredness and selfishness! Now, as regards the IPOB agitations on self-determination, among other things! When we as well-meaning Nigerians citizenry across the country and in diaspora, objectively assess their activities, we discovered that they are armlessly fighting for freedom from all forms of political injustices, marginalization, nepotism, militalization, and discriminations of all sorts in NIGERIA, being currently used by the Northern political cabals against other tribe in Nigeria! Though, they need to be mindful of their use of words in so cases! Wanting to rearrest Nnamdi Kanu is another political cabals’ wickedness and militariocratic detectorship that threatens our true democractic transparency and honesty in NIGERIA, especially from the Federal Executive Government! Nnamdi Kanu should be allowed to exercise his all-inclusive democractic fundermental human rights on freedom of expression and press as globally respected in the Global communities! Yerima wants us to believe that Buhari government of change is not the government that will initiate restructuring in accord with the yearnings of the masses that voted him into power. According to him we should wait until 2019 to usher in a government that will bring about the desired change. It then means that the expectations of the people from this government is misplaced in terms of good governance. Good governance is what the people say it is and not the unarticulated dream of a man who stumbled into government as a ruler. What every patriot & well meaning Nigerians, irrespective ethnic group,religion or other mundane pursuits should concentrate on should be on ways to redress the delibrate exclusion, inequity in distribution of fed Govt appointments into the security agencies,parastatals & other National estetablishments. Review the Military junta Constitution which was delibrately formulated to favour a partcular Region.With the allocated of more Local Govt areas to the North at the detriment of the South.Which have been the remote cause of the endemic crisis & present hightened agitations by different ethnic groups for holistic Restructuring of the Country to meet the genuine aspirations of all the Citizenry. To ensure equity, peace & security to reign in the Country.Therefore,I wish to call on all Nigerians to exchew hate speeches,respect every ethnic Nationality fundamental Rights as enshrined in UNO Charter on diginity of man & rights to self determination without intimidation or hinderance from any quarters. Therefore all boastng by the leaders,their cohorts or the self acclaimed Reps of ethnic groups to avoid boastings or public utterances, which may escalate the already tensed fragile unity in Naija.As no ethnic group or individuals have monoply for violence,any where in the World! Yerima in this interview is the one making noise and talking rubbish,if he is not sentimental why wouldn’t buhari start to put structure on ground for smooth take off on the restructuring of the country rather yerima said that we should wait till after 2019 when another fulani will take over and we continue with our democrazy,on nnamdi b79kanu the man of the moment you are a true leader we biafrans are solidely behind you biafra is unstoppable. As I already said, it is no longer about empty noise making. It is now about the final battle of the 50 years Biafra – Nigeria War, which God has given Biafra victory. It is BIAFRAN REVOLUTION WAR. It is not about before the foreign bandits from Europe invaded Africa, not about before 1914, not about 1967, it is about the present realities- 2017, which is God given Republic Of Biafra of the five south east states. Ekweremadu emphasized the same point- he said 1967 is not 2017, we must be realistic. God do not make mistakes or errors. 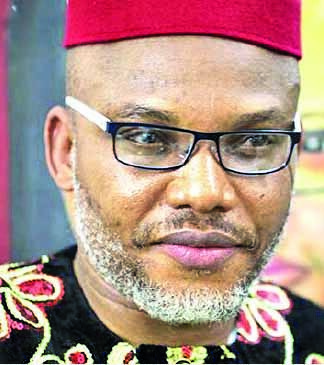 If he kanu is directed by God as he claims, he wouldn’t have be ignorant of what Biafra is, what are involved, what it takes, capabilities and capacity etc., he wouldn’t have rejected Republic of Biafra of the five south east states offer while in the hands of the enemy, he wouldn’t have failed to inform Igbos of the five south east states who are the one concerned and only have the right of democratic decision about it, he wouldn’t have fail to stand for God given Republic Of Biafra of the five south east states and October 1st 2017 Biafran deadline with the political name nigeria. As I already said, ipob group members is not up to one per cent population of Biafrans, and God can raise the grass to fight for Biafra in this final battle. It is now Operation Burn Down All Enemy’s Barracks in Biafraland of the five south east states- it is the final battle, it is BIAFRAN REVOLUTION WAR, it is October 1st 2017 Biafra deadline with the political name nigeria, either kanu with ipob group are in or out. Any Igbo man or woman of the five south east states who do not play his or her role in this final battle of the 50 years Biafra – Nigeria War, will never have a place in God given Republic Of Biafra of the five south east states, will never have rights of Biafran citizenship etc. God Is With Us!!! If you need Biafra state at least be organised and wise not a pack of senseless guy making life difficult for the people they think they are fighting for.